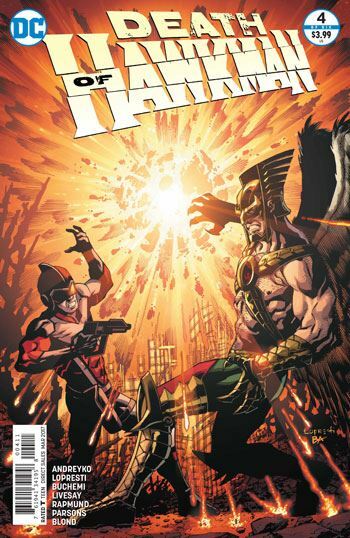 Everything goes up a notch in Death of Hawkman #4. Despero’s plan is revealed, and the villain becomes more deadly by the end of the issue than he has ever been before. There are some surprising revelations, some planetary destruction, and Alanna has to defend herself on a daytime talk show. Each issue of this miniseries has impressed me. Andreyko has crafted his story well, and the collection of artists who worked on the book did some excellent stuff. But I do have one problem with this issue. Something I guess I didn’t notice in previous chapters, or perhaps it wasn’t there. Despero’s homeworld is Kalanor. With an N. Always has been. In this miniseries, the planet is called Kalador. It irks me each time I see it in this book. Sloppy. But that is my only really complaint, and I like to think it occurred through a typo that no one caught, or something like that. A lot of different viewpoints get detailed in this issue, something that really helps with a story that spans four worlds. From the conversations of miners to the insinuendos of talk show hosts, the dialogue creates some quickly drawn but effective and real characters, and rounds out the story very well. I’m having to avoid discussing a couple of major plot points that take place in this issue. Both of them please me very much. I have always liked Despero as a villain, even moreso once they altered the direction of his head fin, and this story is worthy of the character. No actual death of Hawkman yet, by the way. But there are still two more issues to go.